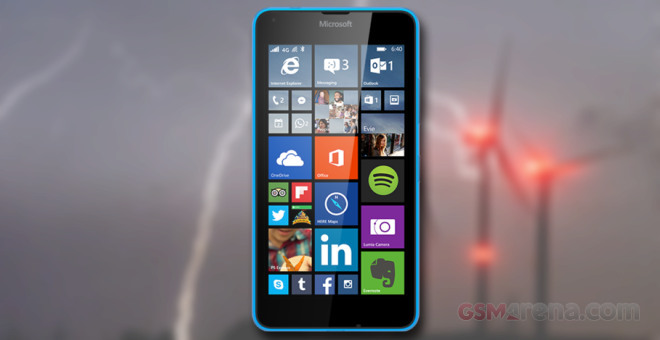 The Lumia 640 LTE has a 5″ HD display, Snapdragon 400 SoC with 1GB of RAM, and is powered by a 2,500 mAh battery. It runs on the latest available Windows Phone 8.1 with Update 2 and Lumia Denim, just like the XL model. The Lumia 640 did great on our 3G talk time call test lasting few minutes north of 23 hours. The Lumia 640 XL did about 6 and a half hours better, but it has a beefier 3,000 mAh battery. The web browsing endurance turned out as impressive as on the Lumia 640 XL – the 5″ Lumia 640 battery went dead after 10 hours and 23 minutes. This meansthe screen of the Lumia 640 and its IE browser as very energy efficient. Spending long hours of watching movies won’t be a problem either, as the Lumia 640 is capable of sustaining almost 10 hours of non-stop playback before its battery drops down to 10%. 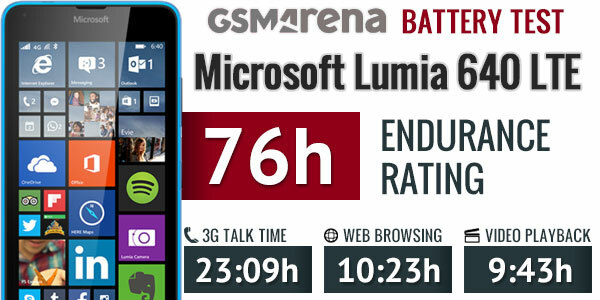 The Lumia 640 outed slightly above average standby score at 11 days, which combined with the other scores helped it achieve and excellent endurance rating of 76 hours. This means it will last three days if you do an hour each of watching videos, browsing the web and making calls each day.